As Ireland goes to the polls for the world’s first nationwide referendum on equality marriage, expatriates all over the world are returning to their homeland to take part in the historic event. Irish citizens living overseas are documenting their journey home on social media, using the hashtag #hometovote, and needless to say it’s sparked emotion. The lack of postal vote options means Irish expats backing the “Yes” vote are traveling from as far as the US and Kenya to make their voice heard. 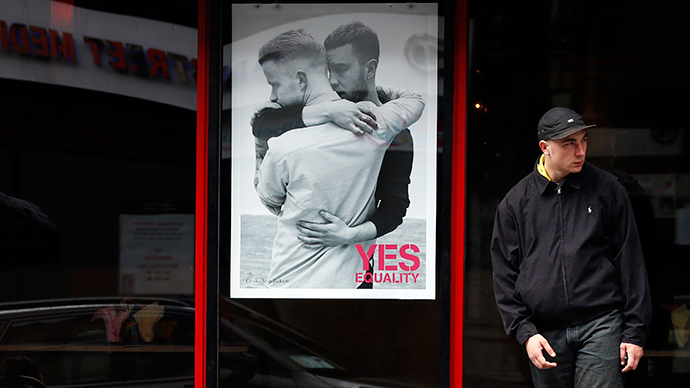 A poll conducted by Irish market research agency IPSOS MRBI last weekend showed that 58 percent of those surveyed planned to vote in favor of gay marriage. Some 25 percent intended to vote against it, while 17 percent were undecided. In recent years, Ireland has seen a steady rise in progressive grassroots politics. Observers say a “Yes” vote on Friday will further highlight this trend. One Twitter user posted a picture of a packed train, carrying voters from London to the Welsh ferry port of Holyhead, where they will board a boat to Dublin, the Irish capital. Another said the hashtag made her “proud to be Irish,” and many proclaimed their excitement at becoming part of the historic day. Results of the vote will be revealed at 22:00 GMT Friday. There's another Yes vote coming!! Booked an early flight home to make sure I'm back on time #hometovote Love is Love after all. Feel like legging it out to the airport to high five all the boys & girls who are #hometovote! GWAN YA GOOD THINGS!!!! Full capacity on flights at @DublinAirport today, acc to Aer Lingus man last night. Loads more #hometovote photos throughout the day!